If you are looking for laser cut car key service, Locksmith for Auto in Tucson Arizona USA, provide Precise cut car key service 24hr in Tucson Arizona call (520) 485-7889 for laser precision cutting chip keys to code, make spare, duplicate, replace lost or broken blade, high security automotive locksmith, programming, copy, replace and repair. 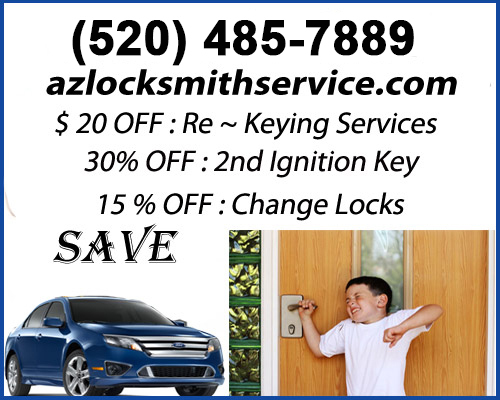 Locksmith for Auto is a locksmith company, fully-licensed and insured to work in Tucson Arizona. Our technicians have more then 10 years of experience, which means they can cut car key, duplicate, replace and make naw keys of any car type, under any condition anywhere in Tucson Arizona, dial (520) 485-7889 for more info. Auto Keys might wear out after few years due to massive or wrong use, cut out a backup set of keys is a wise precaution decision for any smart driver in Tucson Arizona and worldwide, to save you money, we will share a secret, lowe's, home depot and walmart might hold a few simple vehicle key copy capabilities, but today, a large percentage of modern automobiles have keys with transponders chip hidden inside the key plastic head. Automotive manufacturers have started implementing a transponder keys solution as a vehicle anti-theft system (VAT) keys in an effort to fight vehicle theft. The car owner may not even be aware of its existence because there is no external interface, cutting a key blank that is the same shape and size as the original key will probably not going to help, when a key is inserted into the car lock and turned, the car's computer sends a radio signal to the chip, unless the key transponder chip replies with a matching valid code, the car will not allow the engine to start and will move to locked non-start mode for couple of minutes.